It’s summertime! 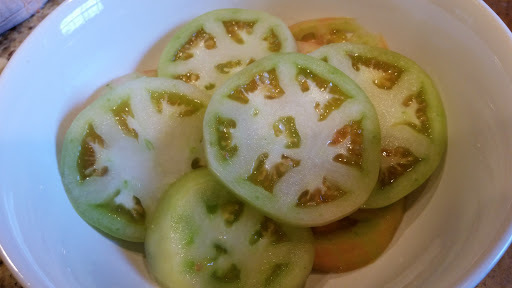 That means fried green tomatoes! 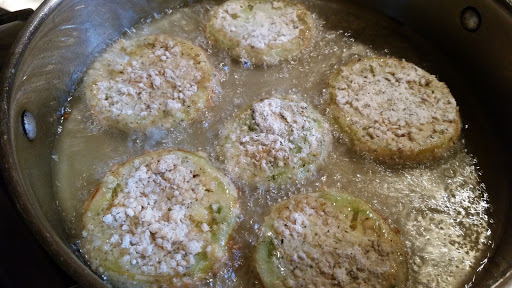 Fried green tomatoes…it’s a southern thing! 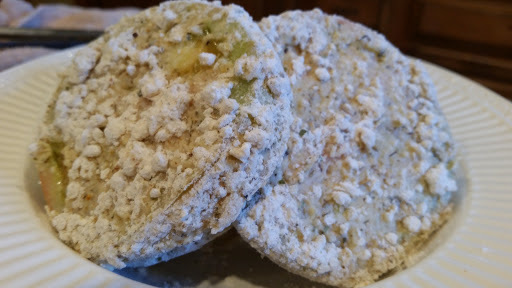 A scrumptious, delicious, makes your mouth water southern thing! I grew up on these and still love them! Begin by slicing the tomatoes about 1/2 inch thick. Next, set up your work station. In the bowl on the left are the tomatoes soaking in kefir. If you don’t have kefir you can use buttermilk or even an egg wash. You just need something that will allow the flour mixture to adhere to the tomato.Whichever you use, be sure and shake off any excess before you put the tomato into the flour. On the right is flour, panko bread crumbs, seasoned salt, pepper, and Italian seasoning. You can use whatever you want for seasonings. Dredge the tomatoes in the flour mixture and put to the side until you have them all coated. Heat vegetable oil in a large skillet to a medium-high heat. Carefully, place the tomatoes into the hot oil. Cook 2-3 minutes on each side or until golden brown. They are perfect just like this, but you can also serve them with different toppings. I’ve had them with ranch dressing, crawfish etouffee, and pico de gallo.